Cherry season is about halfway over here in California. With just a 6-8 week time frame I wanted to make sure I got all my cherry recipes in. 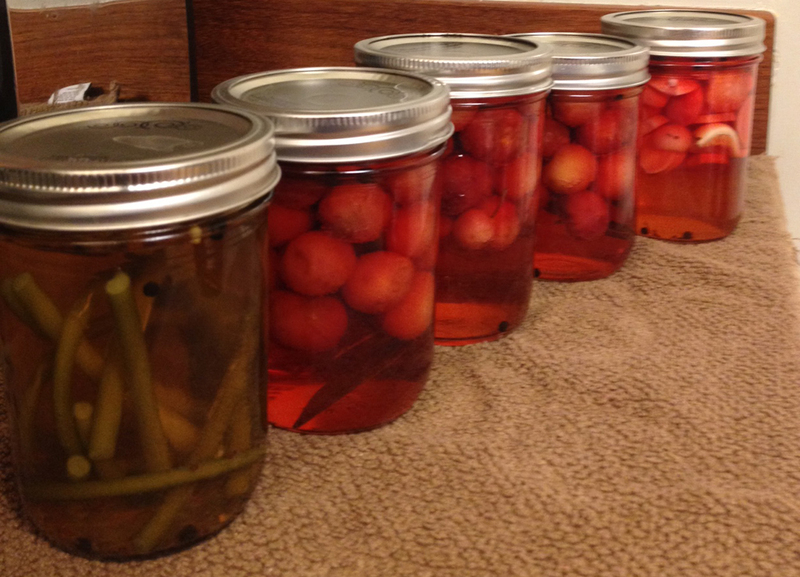 I started with these pickled cherries which ended up being just as gross to eat as they were to look at. Whoops. 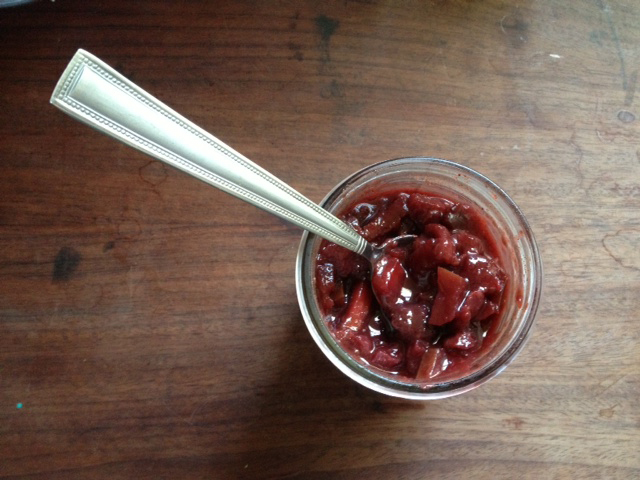 Not one to be discouraged, last week I undertook another new recipe at my mom’s request: cherry chutney. 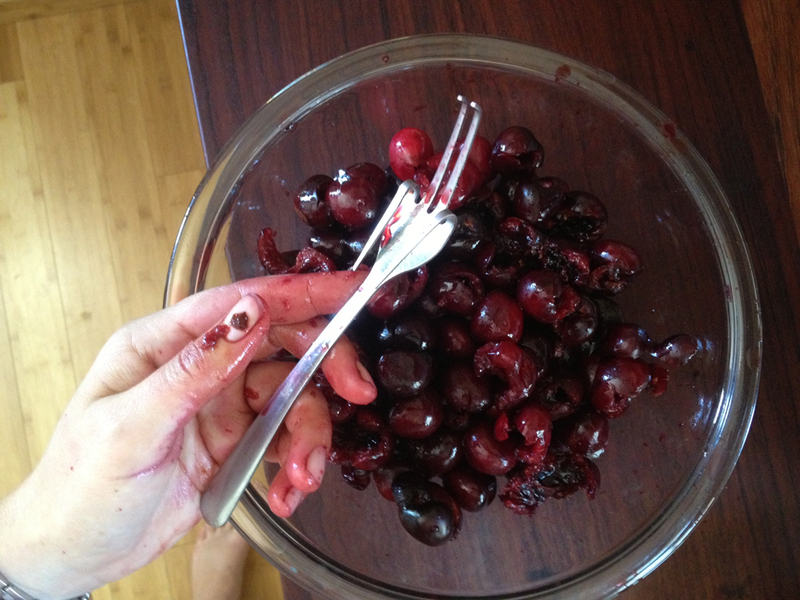 The recipe requires pitting, which I did using this idea for a cherry pitter. I have mixed reviews about this contraption. It did work, but not nearly as cleanly as in the video. It didn’t really matter since chutney needs somewhat mangled cherries anyway. Plus it gave me the chance to experience “blood-and-guts” hands (which for some reason I enjoy). From there I doubled what looked like a promising recipe. Based on the reviews I started with 1/2 cup less vinegar but otherwise I followed it to a T. That was a mistake. I’ve never used Chinese five spice before, but I should have followed my instincts: as I dumped a full 1/4 cup into the pot I was thinking, “Wow… this is a LOT of spice.” I was right – the chutney was astringent from it. Time for triage! I had another green apple so I chopped that up and tossed it in. 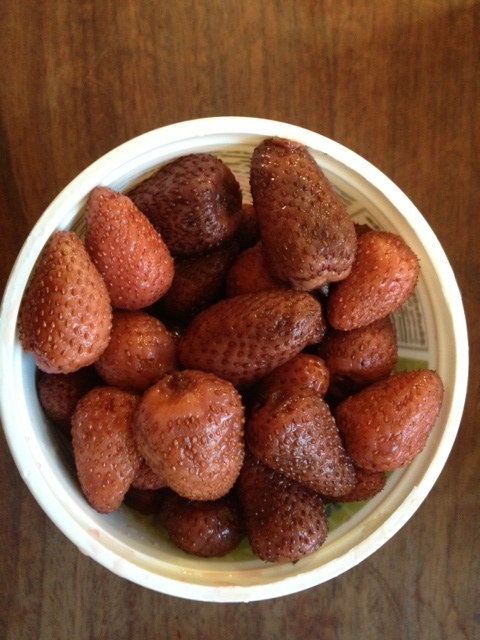 I also had a bunch of strawberries that had soaked in rum for 2 weeks (more on those in another post). A Google search revealed that rum is not out of place in chutney, so after a quick mash they went into the pot. Then I added another cup of sugar because it seemed like it needed it. After letting that simmer for 30 minutes I added lemon juice to brighten everything up, and decreed it DONE. It tastes like Christmas and will probably go really well on pork. So far I’ve had it with goat cheese and crackers, which was delicious. Note that although it tastes good, in the recipe below I decreased the amount of Chinese five spice because even the version I ended up with didn’t need as much. The following recipe made 5 pints, which I put into eight 1/2 pint jars (water bath processed) and one pint jar (will last for about a month in the fridge). You could easily substitute more cherries or regular strawberries for the rummy strawberries, but then you can’t call it Fruity Boozy Chutney. Throw everything into a large pot. Bring to a boil over medium heat and reduce to low. Cover and let simmer for 1 hour, stirring occasionally. If you want a thicker consistency, remove the lid and keep cooking until you’re happy with it. Remove the cinnamon stick. Pour into sterilized jars and process in a water bath for 15 minutes to make them shelf-stable.